These cupcakes are incredibly tender and moist, one of the most delicious cupcakes I have made so far; they are so good that a simpler icing could be used with great results – or no icing at all. Start with the cupcakes: preheat the oven to 180°C/350°F. Line a 12-hole muffin pan – 1/3 cup capacity each cavity – with paper cases (you’ll get 10 cupcakes from this recipe; fill the empty cavities with water before placing the pan in the oven). In the large bowl of an electric mixer, cream butter, sugar and vanilla until light and fluffy, then beat in eggs, one at a time, beating well after each addition. Scrape the bowl with a silicone spatula. Fold in the fruit mince and stir until well incorporated. Sift the flour, corn starch, baking powder and salt over the mixture and carefully fold together with the spatula – do not overmix. Divide the batter among the prepared pans filling each cavity two-thirds full. Bake for 15-18 minutes or until risen and golden and a toothpick inserted in the center comes out clean – the cakes will appear moist, even when cooked. Cool in the pan for 10 minutes then carefully transfer to a wire rack. Cool completely. Make the icing: in the large bowl of an electric mixer, beat the butter until creamy, add the milk and vanilla and beat until light and fluffy. Gradually beat in the icing sugar, then beat until you have a smooth, light and creamy buttercream. Beat in the brandy. 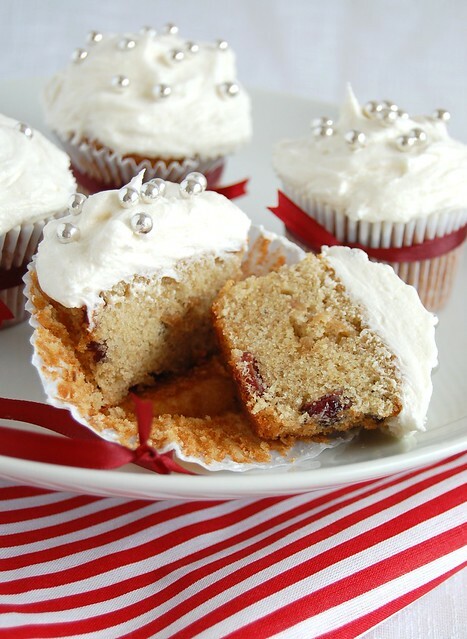 Ice the cupcakes with the buttercream and decorate with candy canes, sugar flowers or silver sugar balls. You are not insane! I stash recipes all the time. I have recipes that are 2 years old that have yet to be tried. Happy holidays, Patricia! Beautiful decoration. 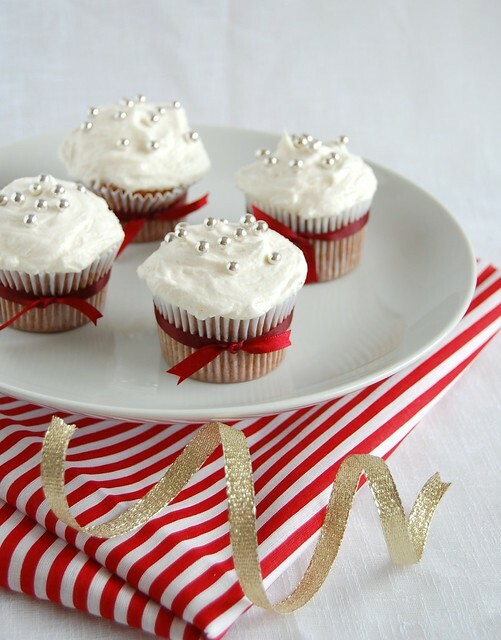 I love the bright red ribbon on each cupcake, it works well with the stripped cloth underneath the platter, very festive. Wishing you a wonderful holiday! Love the dragees. So festive and pretty. And I don't remember the last time I saw such a uniform crumb on a cupcake. Looks yummy!